In early 2015, the MEGABOOM was the biggest, baddest speaker in the Ultimate Ears lineup. To get one, you had to fork over $300. By the end of the year, we were happy to see the speaker on sale for $50 off. Now you can turn that dollar sign into a percent sign... and move it to the right. 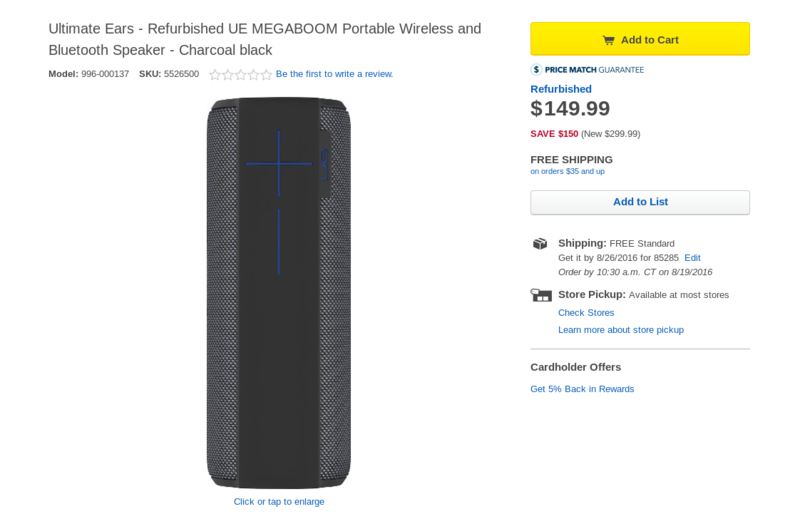 Yup, the MEGABOOM is currently on sale at Best Buy for 50% off. That brings the price down to $149.99. But there's a caveat -- these are refurbished units. But often enough, these products look and function as good as new. The MEGABOOM pumps 360-degree sound and promises 20 hours of battery life. A "Block Party Mode" lets you pair three devices to the speaker at once and take turns playing songs. Then there's the recently added Google Now integration. The sale is going on as part of Best Buy's 50th anniversary sale, which ends tomorrow. Grab yours while you can. And while you're at it, you may want to pick up some Jaybird X2 earbuds. HTC 10 in Camellia Red and Topaz Gold colors finally available in the U.S.